The police in Abuja on Wednesday arrested the Executive Director, Anti-Corruption Network, Dino Melaye, after the former House of Representatives member led pro-democracy activists on a protest, calling for the removal of the Minister of Aviation, Ms. Stella Oduah, over the armoured car scandal. The minister has recently come under fire for allegedly ordering the Nigerian Civil Aviation Authority to buy her two bullet-proof BMW cars, worth $1.6m (about N255m). 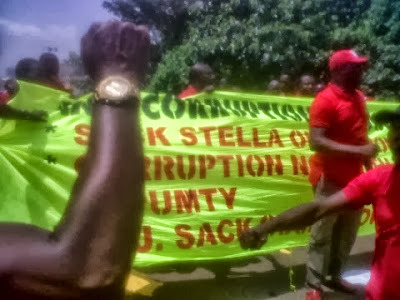 The protest, which held at the Federal Secretariat, Abuja, around 11am, was not without drama as some groups also staged a counter-protest, to drum up support for the embattled minister. While the police averted an impending clash between the two groups, the security operatives, led by an Assistant Commissioner of Police in the FCT, Sunday Olukoya, allowed the pro-Oduah protesters to leave, but stopped the bus conveying Melaye supporters, declaring that they are under arrest. Melaye, however, protested, asking the police the rationale behind the arrest of the protesters and offering to be arrested in their place. The former lawmaker said, “When the police pension fund was stolen, we protested on behalf of the police; we were not arrested. When we protested against the theft of fuel subsidy fund, we were not arrested.